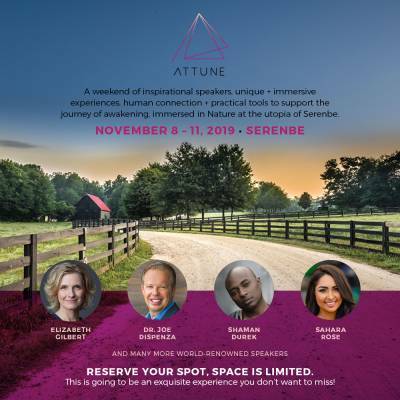 This November, La-based Living Wholly will be hosting a four-day immersive wellness event, Attune, at Serenbe near Atlanta. From November 8-11, you have the chance to hear from speakers such as Elizabeth Gilbert, Sahara Rose, Shaman Durek, and many more. The weekend will be full of workshops, cathartic movement sessions, and human connection all with the intent to support the journey of awakening. Early bird tickets are available now until March 13. Learn more and purchase tickets on Living Wholly's website at https://www.attunebylivingwholly.com/home.